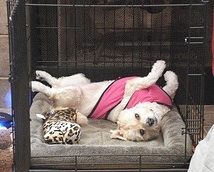 Even those of you who share a bed with your dog will care about this, because a crate is a godsend for a traveling dog. There will be times when you have to leave the dog behind while you go to a museum that checks bags, or to dinner in a place with short tablecloths or strong lighting. A pet-friendly hotel may not require a crate for dogs (though some do! ), but you’ll feel more secure about housekeeping coming in to do nighttime turn-down knowing that your dog is in her crate and can’t slip out the door. With a young dog, it’s great to have the option of crating her while you take a shower. Your hosts may be willing to keep an eye on the dog while you’re out, but they won’t be as alert to potential dog perils as you are. They may have plans of their own, and no matter what they say, they’ll be happier (and your dog will be safer) if your dog is kept from roaming freely in their house. Your dog isn’t crate-trained, you say. Consider crate-training, for all these situations and for others outside the realm of traveling for fun. Here’s an article talking about the benefits of crate-training and providing directions on how to do it. Besides, dogs love their crates just as much as you love your man-cave. Same instinct, same need. The first travel crate we bought was The Roof Box Company’s DogBag. We got the medium size, which turns out to be more than a Cavalier needs — the small size would have been sufficient. Although it’s pretty large, it folds up (with a complicated maneuver akin to the one you may already be using on your car windshield sunscreen) and fits into a normal-sized backpack (provided by Roof Box). It has plenty of mesh netting so your dog has good ventilation and fairly good visibility. The only reason it was our first travel crate and not our only travel crate is that it’s lightweight and Chloe can tip it over and half-collapse it around herself. Not a safety issue, but her bedding ends up sideways. It has been repurposed as her sleeping crate, and will soon get repurposed again as a crate we keep in the back of the car for when she visits my husband at work. It has numerous straps and tie-downs meant to stabilize it on the back seat or in the trunk of a car, so we could use it as a safe car carrier if we chose to. Roof Box also sells an “open air kit” that includes a sun shade and 4 pegs, making the crate useful for camping or picnicking, or as a beach hut. Our second and deeply beloved travel crate is Creature Leisure’s Den. We own the medium size, which is perfect for Chloe, and just about exactly the size of her usual day crate. We love it because, assembled, it is sturdy and solid; and it collapses with the simplest of approaches — the four aluminum poles that provide structure at the four long seams of the crate slip out of their sleeves and are stored in one of the end panels, allowing the mesh side panels to collapse between the two end panels. The resulting 4″ deep rectangle has a strap to hold it closed, and the whole thing fits perfectly into a 28″ suitcase I bought at Tuesday Morning. The included floor pad is minimal, so I have purchased a separate, washable pad (Fetch Dog’s Eco-Friendly Napper in a size medium) that also fits in Chloe’s suitcase. The crate comes with a shoulder strap, which I’ve never had a reason to use, and the company also sells a fairly durable soft bag for the collapsed crate, with enough extra room to fit a supplemental floor pad and some extra bedding. I used it on a couple of plane trips, but eventually decided that a suitcase with a tougher exterior and enough volume to carry all of Chloe’s stuff at once would work better for us. Now we use it for car trips, where we don’t need the protection and bulk of the big suitcase. My only complaint about the Den is that it does not include a clip designed to secure the two tabs of the zipper closing the front panel. Chloe has learned how to scratch the zipper tabs apart and make her escape. I have learned, in turn, that a really sturdy safety pin will hold the two zipper tabs together.